A dishwasher makes a valuable addition to any room - helping to take the stress and hassle out of keeping on top of washing up. We supply a variety of high performance Grundig dishwashers that have been proven to deliver optimum cleaning results, enhanced reliability, and significant longevity. 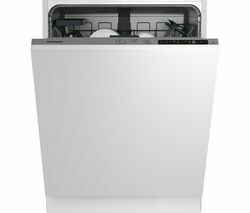 Designed to deliver the optimum performance and efficiency, you can rest assured that, when you invest in a Grundig dishwasher, you will be able to enjoy a range of the very latest, state-of-the-art features on the market, including all-in-wash programmes, quick wash functions, half load functions, and more. Simply load up your dirty plates, cups, mugs, pans, and cutlery, choose your programme, and head off to work, safe in the knowledge that you will return home to glistening, clean dishes. Many of these models even have an auto programme, which senses how dirty your dishes are and adjusts the wash cycle accordingly - ensuring a thorough and efficient clean every time! There is also a Quick Wash facility that will allow you to wash a full load in under an hour, perfect for if you're in a hurry. And, because it's important that your Grundig dishwasher doesn't impact on your living environment or your bills, all of the models we supply minimise sound whilst optimising energy efficiency. Limited on space? No problem! The Grundig GSF41820W Slimline Freestanding Dishwasher and the Grundig GSF41820B Slimline Dishwasher will fit seamlessly into less spacious kitchens - providing the same level of performance as full sized Grundig dishwashers within a slim, compact design. If you can't find what you're looking for, why not explore our other dishwashers? We're sure you'll find a AEG, Amica, Beko, Hotpoint, Kenwood, Samsung, or Bosch dishwasher that meets your requirements. We also supply integrated dishwashers that will blend seamlessly into your kitchen design.